Some days a little mindless Slayer worship is just what the doctor ordered. Been in a Kraftwerk mood lately. This record surprised me in a few different ways. 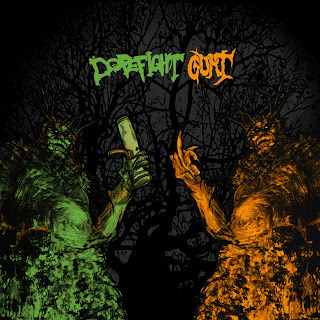 I had just got done listening to London-based Gurt and their first full-length record that was released in 2011 and, while it was instrumentally sound, the vocals just weren't doing it for me. Having then realised they only actually formed in 2010, I went on to check this out too and not only did I find a tight, Iron Monkey worshipping, southern sludge metal band with BIG grooves, the vocals were far more mature and the two tracks cut for this split, which was self-released, are sign of a band cutting their teeth and getting better all the time. Not only am I really digging the Gurt side, it also happens to be better than Dopefights side. I also love this video, with the 16-bit, platform side-scroller intro. Surf & hot rod instrumental group from Spain. One of the most beautiful, Heavenly sung track I've ever heard. This song actually inspired me to become an author. If you find a successful book in the next few years about hippies, it's probably by me. Motley Crue's 2000 album, New Tattoo, never gets any love. The hair band resurgence hadn't happened yet, so nobody was ready to care I guess. It wasn't quite brilliant, but it was their most solid album since Dr. Feelgood. Of course if you're like me and you think that Dr. Feelgood is overrated and mediocre then New Tattoo is their best since Shout at the Devil. Couldn't find any tracks on Youtube. New album from surf/rockabilly guitarist Deke Dickerson.